This thesis brings my earlier reading on "FORMLESS URBANISM" city of Chanod. The formlessness condition that exist in the city are valuable tradition of soft urbanism and festivals are one of them. There was time in academic world that the cohesion is a formal property and essential one for cities. The uniqueness of urban form is embedded in recognition of cohesive form of the cities. The earlier theoretical account of urbanism dealt with these uniqness attached to social and cultural welfare of the cities. The role of academics and urbanity were strictly controlled by such notion. The recent trend in research is upsetting these notion of cohesion and clarity into spatial contamination of urban form. Although the built-form & architectural heritage bestows the social and cultural personality to the city, the spatial and spectacle event adds the uniqueness to the city. 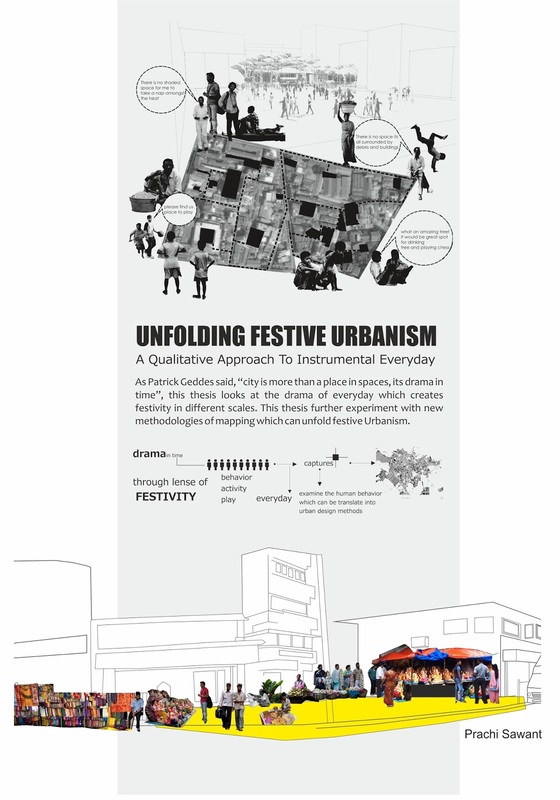 The thesis attempts to conceptualize the framework of integration for the festivals as part of everyday urbanism. The festival often proves to be dominant priority in space and time and it generates, regulates, shapes our cultural priority and social behavior. The character of built-form is in its capabilities to arrest this moment of festivity, everyday urbanism along with sensory experiences. The thesis project excels in various areas which are central to research in architecture and urabnism, namely, critical framework for research question, methodologies for mapping and representation. The thesis has skilfully demonstrated & raised the question in theorizing & research tendencies on one side and framework for performative space on other side especially in Indian urban context. 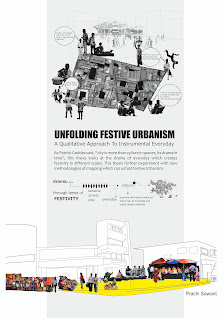 PRACHI SAWANT HAS WON THE NIASA GOLD MEDAL AT NATIONAL LEVEL, FOR HER THESIS PROJECT OF "UNFOLDING FESTIVE URABNISM"